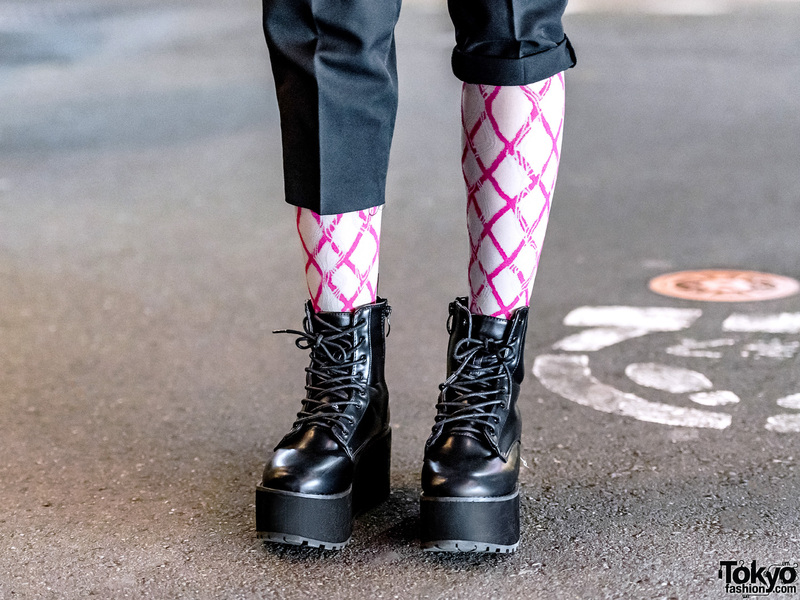 We stumbled upon three familiar faces on the streets of Harajuku. 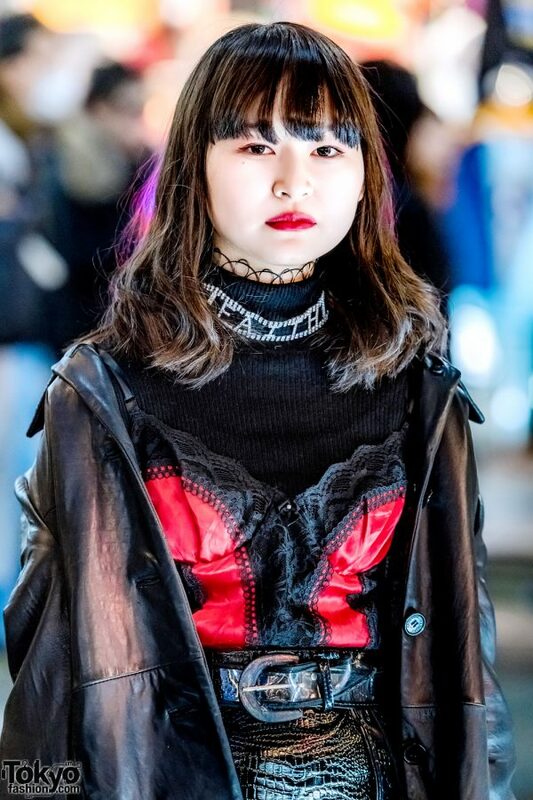 Teenaged students Kaya, Kunieda, and Miyu – all of whom have been featured on this site before – stepped out in their edgy ensembles and caught everybody’s attention. 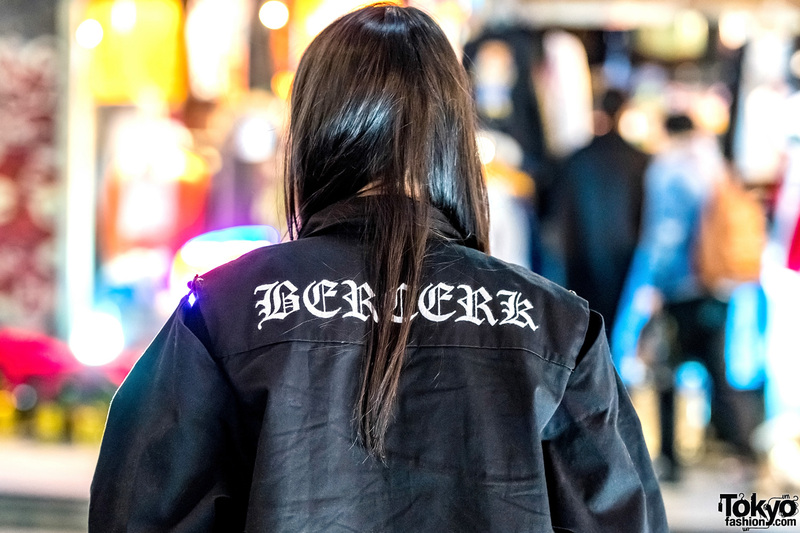 On the right is Kaya in an all-black outfit that consisted of a Never Mind the XU x BERCERK zip-up jacket over a Forever 21 turtleneck top. 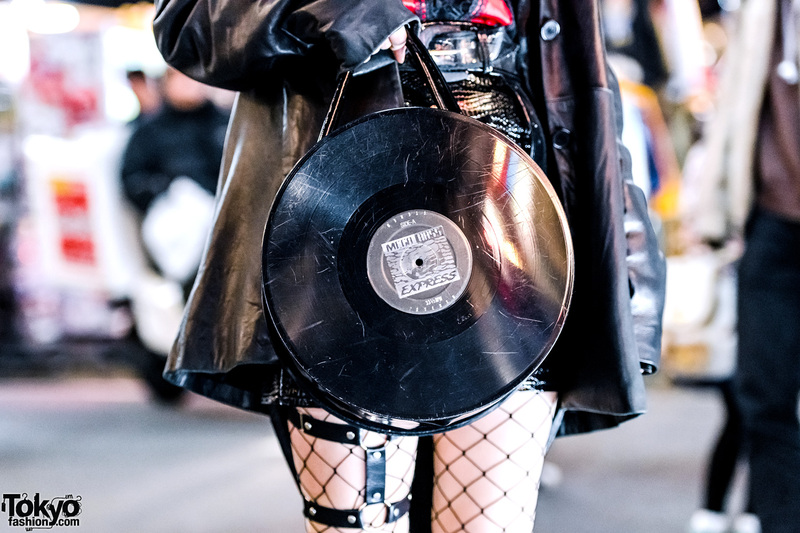 The 15-year-old also wore a black leather mini skirt with zipper trims from WEGO, which she styled with a wide black belt and black fishnet stockings. 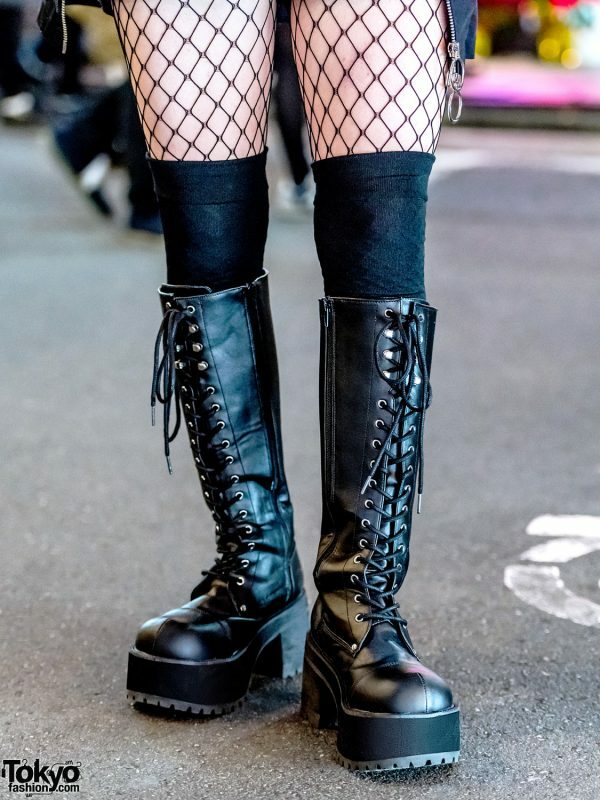 She completed her look with a bold red lip, black knee-high socks, and tall platform boots from Demonia with block heels, side zip closures, and a lace-up design. Kaya’s favorite fashion brands include Faith Tokyo and Never Mind the XU. Follow her on Instagram. In the middle is Kunieda wearing a purple hat from Vivienne Westwood and blonde hair with pink tips. 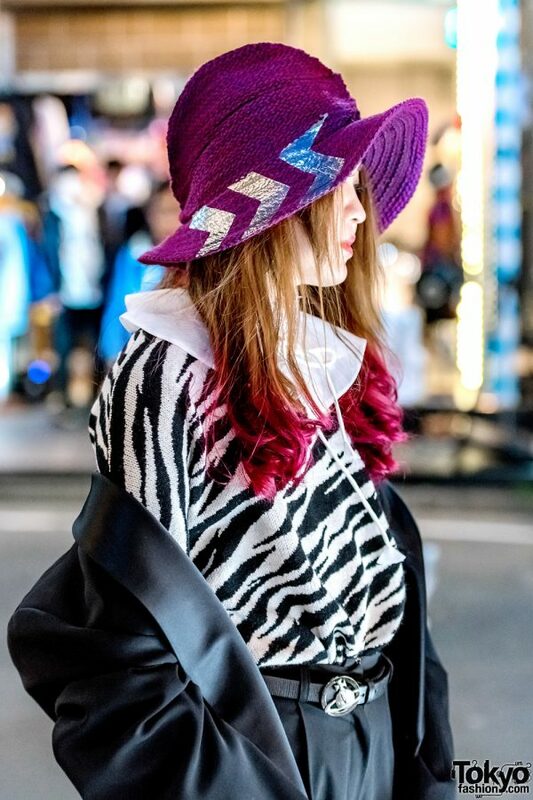 The 17-year-old donned a black Comme des Garçons jacket over a zebra-printed top from X-girl. 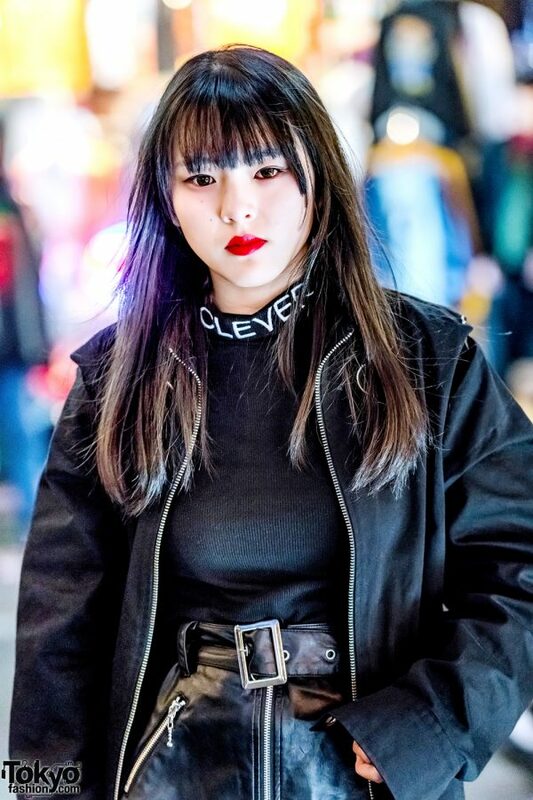 Kaho also wore cropped black pants from Faith Tokyo, a black leather belt, and a white Beams ruffle collar with knot detail and fringe trims. She finished off her look with a bold red lip, printed socks from Vivienne Westwood, and Bubbles black leather lace-up platform boots. Kunied’s favorite fashion brand is Vivienne Westwood. She is active on Instagram. Finally, Miyu stepped out in a black vintage jacket over a Kinji top. She wore a black ribbed turtleneck under a red-and-black tank top with floral lace trim and tucked them into a Faith Tokyo black snakeskin mini skirt. 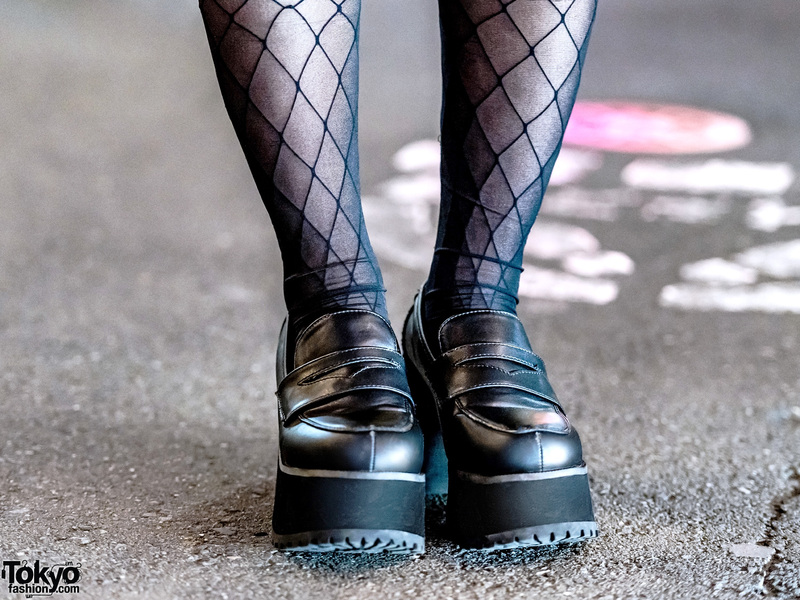 The 17-year-old styled them with a buckled belt, black fishnet stockings, and Peco Club black leather platform shoes. Red lips, Faith Tokyo accessories, and a G2? vinyl record bag provided the finishing touches to her look. Miyu names Never Mind the XU and Faith Tokyo as her fashion favorites, and she is active on Instagram.